Please contact the owner directly @ 517-290-4835...This fiberglass Chris Craft was built on a true deep-V hull. This gives it superb handling qualities in heavy seas and a very solid ride. There is a large cockpit area with aft seating, twin seats at both the helm and passenger side, and lots of room to move around. The interior is spacious and well planned, with an L-shaped full galley and a dinette with a settee opposite. The dinette converts to a double, and the settee converts to bunks. With the inclusion of the double V-berth, this cruiser will sleep six (6). There is an enclosed head with toilet and hand shower opposite the galley. 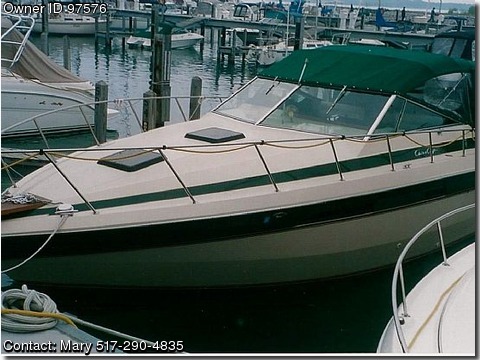 This boat is in very good condition and has been properly maintained. This boat has always been in the fresh waters of the Great Lakes. She is powered by two (2) 1981 350 Series Marine Power in – board gas engines. Engine hours are 1400 and have been reconditioned. Fuel capacity is 250 gallons. Horsepower is 350 @ 4400 rpm. Cruising speed is 21-22 knots with a maximum speed of 30 knots. LOA is 35 feet; beam is 12’4”. Equipment includes: 2 burner electric/alcohol stove, refrigerator, AM/FM radio with CD, hot water heater, shore water, bow pulpit, swim platform, camper canvas, depth sounder, marine radio, compass and Garmin GPS.